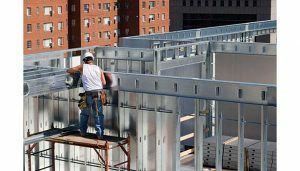 Mid-rise construction—typically ranging from four to 12 stories high—has been a growing trend in recent years in many markets throughout the United States, with cold-formed steel framing playing an integral role. Widely used in commercial construction since the early 1960s, CFS has long been a cost-effective, high-performance material option for framing applications in mid-rise buildings, as it is often more practical than traditional framing materials. Wood framing, for instance, is typically limited to use in four- or five-story buildings, depending on the local codes and systems being utilized. And, concrete and structural steel, aka “red-iron,” systems tend to be cost-effective only for high-rise building projects, which involve 13 or more stories. Over the past 50 years, manufacturers have developed CFS products for an increasing variety of framing applications to simplify the installation process and save contractors time and money. In this article, we will compare traditional steel framing methods with newer, more efficient methods that are ideal for mid-rise construction projects. We’ll also look at new ways for architects and general contractors to integrate and coordinate all trades involved in a project, leading to more efficient operations and a faster completion than with traditional construction methods. One area of CFS framing that has produced considerable product innovations that not only offer labor and time savings but also consistent quality, predictable performance and high strength to weight ratio is floor joists.